Jill Moore, director of Greek Life at Auburn University, credits Auburn Panhellenic’s national recognition and recruitment success to the executive board’s foresight and planning throughout the year. According to Moore, the needs of the potential new members are top priority in preparing for recruitment, including scheduled breaks between sorority visits. They could even catch a football game during the breaks – but not just any football game. Panhellenic played the final quarter of the 2013 Iron Bowl on repeat during breaks to keep the potential new members encouraged and the energy high. In addition to the Panhellenic Executive Board, 84 Panhellenic recruitment counselors, or Pi Chis, are assigned to smaller groups of potential new members to educate them on everything pertaining to recruitment, the campus and Auburn in general. Pi Chis receive extensive training and even participate in team-building activities like whitewater rafting. Alexis Barranca, Panhellenic president at Auburn, said this year’s recruitment and the recognition from the National Panhellenic Conference are a result of collaboration and endless effort. Of 660 college Panhellenics across the nation, Auburn was one of only 32 universities to receive recognition from the National Panhellenic Conference, and one of just 21 to receive the Achievement Award. 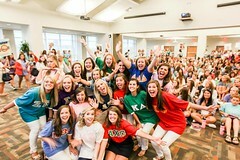 This places Auburn Panhellenic solidly in the top 5 percent nationally. As she begins her senior year, Barranca offers advice to the freshmen just beginning their Auburn careers.